We believe in making the most of the skin you were born with through maintenance, maintenance, maintenance. Thats the key to healthy, younger looking skin. Our facials are performed using the best ingredients on the market today. We use products that are free of alcohol, fragrance, dye, mineral oil, and lanolin. Our skin care products are scientifically proven to replenish and hold moisture in the skin. All facials are done European style, meaning the treatment is given to the face, as well as the neck, shoulders, and décolletage. 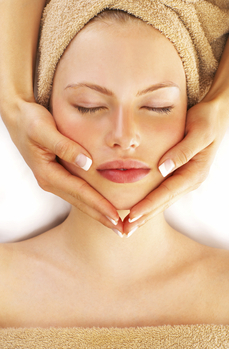 All speciality facials include the European facial. We can suggest the appropriate treatment for your skin. All of our facials deep cleanse, nourish, and moisturize. We will be glad to consult with you on ways to help your skin stay healthy on a day to day basis. The exfoliating facial cleanses away dead skin cells and opens up pores through a 40% glycolic peeling treatment - acne, fine lines, and wrinkles are diminished. Excellent for sun damaged skin. A less aggressive exfoliation, the papaya treatment gently cleanses the skin, opens the pores, and stimulates skin rejuvenation. Wonderful for sensitive or dehydrated skin. The classic European style facial with Hylunia products which provide the perfect antidote for sensitive, dry, and mature skin. The use of papaya and glycolic in a double dose treatment that allows papaya to soften the skin and glycolic to remove the dead skin cells. This is the first treatment to combine pure extracts of Vitamin C in high concentrations with the gentle exfoliation of a papaya facial. Excellent for sun or smoke damaged skin, Acne, Rosacea, Psoriasis, and Eczema. Ideal for combating wrinkles, this treatment combines cleansing with a cleansing gel, a gentle peeling, and steam bath to soften skin and stimulate blood circulation. A skin type specific mask rehydrates and alleviates puffiness. A hydro replenish serum is massaged into the skin and nourishes and leaves it supple. A massage with moisturizer finishes this invigorating treatment. Try our new treatment bursting with citrus flavor to re-fresh your senses. Your skin is gently cleansed with a mango-infused gel. This energizing blend delivers anti-oxidant benefits from mango revitalizing your skin. You are ready to receive a double dose of natural fruit exfoliation with pineapple and papaya enzymes. European-style extractions are performed. A relaxing massage with lemongrass essential oils will follow. A brightening papaya mask to help improve circulation, tone, texture and smoothness is applied to hydrate and calm your appearance. A multi-vitamin cream is applied to moisturize, lighten discoloration, and provide an anti-oxidant treatment as your finishing touch. This facial is truly a unique tightening treatment to improve the appearance of mature skin. This beneficial masque incorporates natural ingredients like milk proteins, plant extracts, seaweed extracts, and minerals to aid in tightening the skin, enhance circulation, diminish lines and wrinkles and create a fresh, youthful, appearance and feeling. Layer 1: This service begins with a rich cream cleansing and an enzyme peel rinsed with salt water and a steam treatment followed by a facial massage. Layer 2: Lightweight Gauze Facial Mask lets the paraffin flow through to warm and soften the skin. Layer 3:Colloidal Silver with Lavender Floral Water is a time-tested curative blend of hyaluronic acid, colloidal silver and lavender flowers to create a revitalizing tonic and therapeutic floral water. Layer 4: Warm Parrafin gauze mask improves skin tone encourages moisture retention. Layer 5: Calming Facial Wrap with Eye Pads lightly envelopes each of the healing and hydrating layers together to allow for a relaxing experience. The results are amazing: a youthful and rejuvenated appearance while you restore your mind, body and soul! This facial package is ideal for face and body. First, receive a papaya, glycolic, or vitamin C facial for your face, then flip over and receive the same TLC for your back.